Steve and the rest of the Reinvention Radio Crew discuss the fiesta in the desert known as Burning Man. What is it all about? 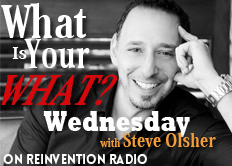 Steve believes it’s ultimately about reconnecting with yourself, tapping into how you’re naturally wired to excel and getting out of your shell.